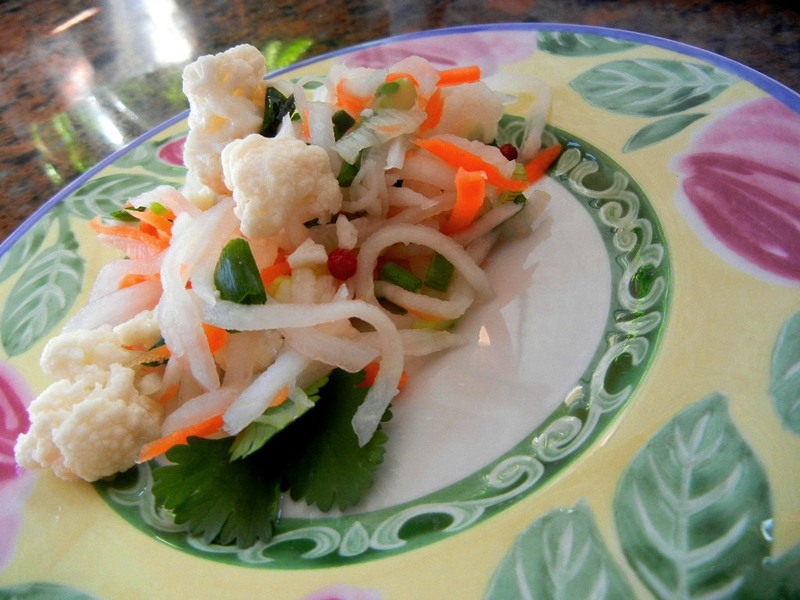 In a medium bowl combine radish, carrot, cauliflower and green onion. In a small sauce pan, combine vinegar, mirin, salt, sugar and peppercorns. Bring to a boil and remove from the heat. Pour pickling liquid over the vegetables. Toss lightly to combine. Allow to marinate for a couple of hours. Just before serving, add in the handful of coriander leaves and serve — over fish, chicken or on tacos or hot dogs. I think the possibilities are almost limitless. Playlist included Just Like Honey, a compilation of eleven bands covering this one, fabulous song. Nice combination – slaws of veggie goodness always remind me of summer too – but stay away from the tomatoes until the local ones are ripe. Pickled julienned daikon and carrots (red and white is considered very auspicious) is served. My father was in charge of making this – julienned daikon and carrots in a simple “vinaigrette” of rice vinegar, little salt, mirin and sugar. Your slaw brought me back to New Year’s at home with the parents… Thanks! Thank you! I love that I’m getting it kind of right. And have a new day to serve this! I’m fairly certain there are so many variations of this dish throughout Asia, or countries that use daikon in their cuisine. I am going to try the scallions – and maybe some slivers of ginger. My daughters’ pickled turnips can surely use a switch to daikon!